Besides the Chinese Crested Dog, there are a number of other hairless breeds throughout the world. The American Hairless Terrier is a lively, intelligent,alert and playful dog. In build, the American Hairless Terrier is identical to the American Rat Terrier to whom he is directly descended from. Loving and docile with family and friends, the Khala, can be aloof and standoffish with strangers. Khala's come in 2 sizes-the Medio [short legged,also called the pottery type] and the Grande [long legged of sight hound type]. Inca's are calm and quiet. Intelligent and independent, they are devoted to their owners, reserved with strangers, till they evaluate the situation. Calm, quiet dog, cheerful, attentive, alert, the Xolo is suspicious towards strangers, makin a good watchdog. The Xolo comes in 3 sizes. The Standard, Intermediate and Miniature. 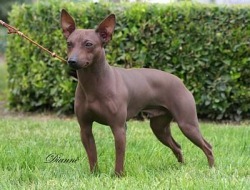 The Tepeitzcuintli is the same dog as the Xolo, but the miniature version. 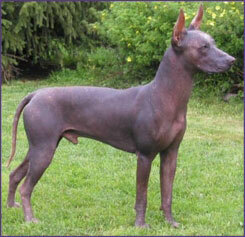 The most naked skinned and rarest, the Ecuadorian Hairless Dog has golden colored skin and long legs. Some say that he may be a cross between a Xoloitzcuintle and a Perivian Hairless Dog. The Manchurian Hairless Dog is a relative of the Chinese Crested Dog, from the Northern Regions of China. The African Sand dog or Abyssinian Sand Terrier can be fully coated, hairless or almost hairless, except for tufts on its head and tail. They have long slender legs, bat-like ears, a long muzzle and an arched neck.